Most of our children enter the world in the usual way via birth to a mom and dad. Derek entered our lives just a tad differently. In 1994, my late husband and I lost our only birth child, a daughter, to a severe heart defect when she was just six. She had Down syndrome, so we were well versed in the special needs world. I was 41 and my husband was 42 when she died. After time had passed, we found that we were incredibly lonely. So we decided to adopt an older, unwanted, American child, special needs considered, as long as the child wasn't under a 'death sentence' like our little girl was. We just couldn't bear to go through that again. Due to our ages and the fact that we had 'done' our baby, we decided to leave the babies to the younger parents. We found a good agency. We jumped through all the hoops (and there were many) and settled in to wait. If biological parents were put through what we were put through to adopt, there would be a lot less abused and unwanted children. There were a couple of false starts. Then, out of the blue, I got a call from our adoption worker. There was a little 3-year-old boy who had beenl egally adopted while overseas by American parents and they were en route with him back to America from the Republic of Karelia, former USSR. Would we consider taking him, at least under a foster basis? This quite possibly was a potential international incident. The first set of parents noticed some very bizarre (in their minds) behavior on behalf of the little boy. They decided they couldn't parent or love him. When they arrived in the USA, they immediately revoked their parental rights and the little boy was placed in one of the agency's foster care homes in Silver Spring, Maryland. Under Russian law regarding the adoption, Derek was considered to be a domestic adoption by the laws here in the USA. He was issued a green card and Medical Assistance. The foster mom took him to Children's Hospital in D.C. where the geneticist there gave him the FLK label (meaning 'funny looking kid'). This is not meant to be an insult. It simply means the doctor knew something was up, but not what it was. Then he was taken to a developmental pediatrician who said the same thing. During the Children's Hospital visit, the little boy also saw a cardiologist who detected a faint heart murmur. I immediately said yes, then called my husband to inform him and he readily agreed. Shortly after, I traveled to Silver Spring, Maryland, to meet this little boy. When I arrived at the foster home, there were children of all colors there...I called it the Rainbow House. The foster mom called for the little boy, whose Russian name was Zhenya (short for Yevgheny). He came out of nowhere, walking with a toddler's gait even though he was 3. He came flying over to me and climbed on my lap and studied me with the two most beautiful blue eyes and the longest lashes I had ever seen. He also looked scared and sad. He had the worst haircut I'd ever seen and some of his clothing was girls' clothing, plus he had one ear that stuck way out. Funny looking kid, indeed! He wrapped his little arms around my neck and held on for dear life. It was a done deal. I was instantly bonded with him. At that time a car seat wasn't required for a 3-year-old, so I hadn't brought one. The foster mom graciously loaned me one as Zhenya was so small for his age. I loaded him up with his few meager belongings and a couple diapers as he wasn't potty trained. I drove back to my husband's job where he met little Zhenya. Zhenya went right to my husband's arms while all the employees were watching. Again, instant love. My husband took the rest of the day off and we took Zhenya to his new home. We called all of our friends and family to tell them; we were so excited and happy. We couldn't imagine how little Zhenya was feeling inside with all the changes and hearing a different language. He had been traveling for a very long time and had only been in his foster home a few days. The first thing we did was feed him, but I don't remember what. He displayed 'orphanage' behavior by wrapping his arms around his plate and shoveling the food in as fast as he could. After eating, he was so tired that we put him to bed early and he went off to sleep. Then I made a much needed shopping trip to a WalMart to at least get him the basics. The next morning, he didn't get up and come running out of his room like most children. He was awake, but stayed in his bed. We later figured out that in the orphanage he was taught to stay put until all the adults were up and about and came to get him up. It only took him a couple days to figure out that he didn't have to do that anymore. Not long after, our family and friends gave us a 'baby' shower! We got some much needed items for him and toys, toys, toys. Zhenya opened all the packages himself and his grin could've split his face as he discovered what was in each. His big blue eyes got even bigger. We all had a great time! Zhenya (or Yevgheny), loosely translates into English as Eugene. We weren't enthused about that name and settled on Derek. To teach him his name, we started calling him 'Zhenya-Derek', then eventually dropped the Zhenya. The only Russian words I knew was 'da' and 'nyet' (yes and no). So I began using the sign language I had learned to use for my daughter, signing and saying the word at the same time. It took a very long time for Derek to say anything at all, plus he had a bad drooling problem. Eventually, he did begin to understand receptive language, but still he rarely spoke expressively. We saw that Derek did have some weird behaviors that mostly came out when he was stressed by a new situation. He would literally drop on the floor and begin violently rocking back and forth, humming loudly while sucking his thumb and closing his eyes. He also did this to put himself to sleep. The first few times I gave him a bath, he totally freaked. He was absolutely terrified! I had to resort to using the shower or a sponge bath for him as he wouldn't sit down at all in the tub. There were many challenges with our new son, some of which were obvious developmental delays and some of which were orphanage related. I then called our school system's early intervention program and someone was sent to our home to evaluate Derek for developmental delay (which I already knew he had). Of course, he immediately qualified and various therapies and half-day school was begun. A school bus picked him up right in front of our house and dropped him back off home. He loved the school bus ride! Then I called one of the two biggest teaching hospitals in Baltimore, Maryland, and made a genetics appointment for Derek. He was thoroughly observed and photographed by the very caring geneticist. 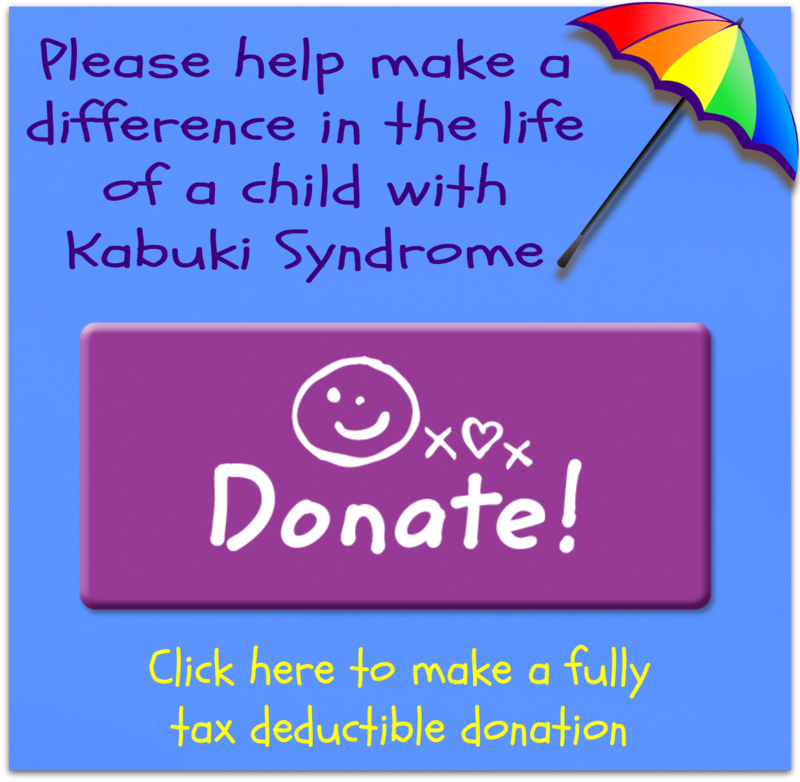 Not long after, I received a call from the geneticist and was told that Derek had Kabuki syndrome, but his chromosomes were normal. I blew him away because I already knew what that was! The reason I knew was that our late daughter had attended early intervention AND day care with a little girl who had Kabuki syndrome. This little girl also had the exact same heart surgery as our daughter (it failed for our daughter, but worked for her), by the same cardiac surgeon, at the same hospital, just 4 months after our daughter had died. I don't believe in coincidences. In addition, it turned out that our geneticist's 'specialty' was in Kabuki syndrome. He was very familiar with it as it greatly interested him. Again, I don't believe in coincidences. I then researched everything I could get my hands on regarding Kabuki, but there wasn't a whole lot and the Internet wasn't available then. I began making appointments with many specialists to check on the major anomalies involved with Kabuki. I took Derek to his new pediatrician who discovered the mild heart murmur also, plus the fact that both testes had never descended. A cardiologist confirmed the heart murmur, which is caused by Derek's heart having a bicuspid aortic valve. Normal would be a tricuspid. It's caused him no problems, but is monitored on a yearly basis. A pediatric urologist confirmed that his testes had never descended and surgery was scheduled, the first of many. Derek was checked for horseshoe kidneys and his were discovered to be normal. Gradually, Derek settled in and we learned how to properly care for and help him. Thanks to our daughter, who taught us a lot more in her six short years than we ever taught her, it lessened the challenges for us as we had already been there, done that. Due to all of the above 'coincidences' (that I still don't believe in), it became quite obvious that we received the child we were meant to receive, just like any biological parents. His first set of parents were good people, I'm sure, but they hadn't a clue and the behaviors scared them. They did the right thing for both Derek and us. They were able to return to the orphanage and adopt a 'typical, normally developing' child. I was happy for them, but then, there's no guarantee on 'normal'...anything can happen in life. We wished them well.